100% cotton. 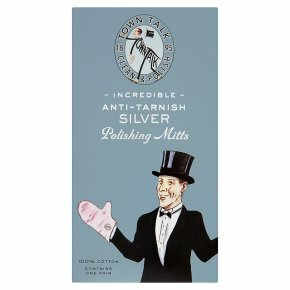 For the care and protection of beautiful treasured possessions.These splendid lined Silver Polishing Mitts are a favourite of Mr town Talk's. They provide a quick and easy way of dusting silver and removing light tarnish, without getting your hands dirty. Directions Simply Don a Silver Mitt and Polish your silverware. Each Mitt contains a special mix of cleaners and anti-tarnish agents designed to give a deep, long-lasting shine and protection against tarnish. Mr Town Talk's Top Tip To prevent the staining caused by foods such as eggs, vinegar, salt and salad dressings, always rinse your silver cutlery as soon as possible after each use. DO NOT WASH. KEEP OUT OF REACH OF CHILDREN.